I’ve been talked into doing the Trans Baviaans. It is the world’s longest single stage team mountain bike event. It starts in Willowmore in the Karoo and finishes on the other side of the Baviaanskloof in Jeffrey’s Bay 230km later. It’s on 17 August 2013 and it involves training through the winter. Naturally, I’d like to do well with my teammates. And I know that in order to achieve a good result, and not to be the weakest link, I have to work on my numbers. What I mean by this, and I’m no professional, but power (the power you can generate, measured in Watts, over a long period of time, i.e. sustainable power) and weight. The lighter you are and the more power you can sustainably hammer out, the faster you will go, and in the case before us, the less time I will spend with my teammates riding at night. So, it is project “power up and lose weight” that I am undertaking. I need to get my power to weight ratio (measured in Watts per kilogram) up. I don’t have a power meter, but I can tell when I’m strong, and there is a scale at gym that I’ve started hopping onto. And because for most amateur riders, weight is more measurable, I’m going to focus on that. And I’m also going to cut to the chase and get to the thing that inspired this blog. Here we go. Obviously it’s not just one’s own body weight that one has to haul around. The weight of your equipment is factored in as well. The heavier your bike, in particular, the slower you will go. Bottom line. So most people who are mildly serious about cycling want to have a lighter bike. Off I went to look at new bikes. I thought to myself, “I reckon I deserve a top of the range carbon fibre racing bike with the lightest components”. I checked out the bikes- there was one that had a claimed weight of 10.5kg and another, the top of the range one, which had a claimed weight of 9.8kg. That is very light for a mountain bike! Now, how much would you expect to pay for the 700g advantage? Think calmly about that before you answer. The 10.5kg bike was going for R30 000.00 and the 9.8kg bike was going for, drumroll please, R54 000,00. Now, friends and fellow amateur mountain bikers, you don’t need to be a rocket scientist to realise that you will pay more than R20 000.00 for under a kilogram of weight saving. I can fully understand this kind of expenditure if you have no more weight to lose. But, you do, and the chances are that you are overweight. Please don’t let your lack of discipline in not training and in over eating spill over into an irrationally motivated, ill financially disciplined purchase of a super light bike. Out of principle I don’t think people who could lose some weight should be shelling out for super light bikes. 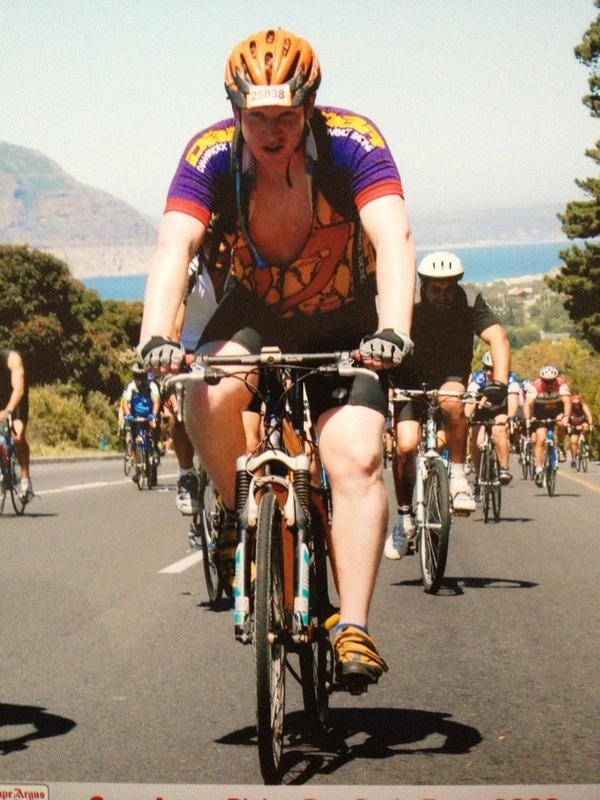 Rather drop that extra kilogram around your belly than drop R20 000.00 on an undeserved bike. Yes I did say that. Fortunately I’ve dropped most of the extra weight you see in that photo from 2008, but I’ve got at least 700g to go. So I’m hanging on to my current bike… for now! It’s gonna be a good one!